Protein sulfur functions are essential in numerous events related to oxidative stress. In the regulation of all events involving free radicals, such as oxidative stress and irradiation by ionizing radiation, one-electron redox processes take place and sulfur free radicals are created. Their properties play a key role in the reactions leading to cellular eifects. The most important sulfur free radicals are thiyl and disulfide radicals. They interconvert into each other (Scheme 1), because the disulfide radical anion undergoes S-S bond opening and the thiyl radical adds to thiol function to give the disulfide radical. 1 H. Nakamura, K. Nakamura, and J. Yodoi, Anna. Rev. Immunol. 15, 351 (1997). 2 G. Powis, J. R. Gasdaska, P. Y. Gasdaska, M. Berggren, D. L. Kirkpatrick, L. Engma, I. A. Cotgreave, M. Angulo, and A. Baker, Oncol. Res. 6-7, 303 (1997). 3 A. Baker, C. M. Payne, M. M. Brieh, and G. Powis, Cancer Res. 57, 5162 (1997). 4 A. Gallegos, M. Berggren, J. R. Gasdaska, and G. Powis, Cancer Res. 57,4965 (1997). 5 S. Kojima, o. Matsuki, T. Nomura, A. Kubodera, Y. Honda, S. Honda, H. Tanooka, H. Wakasugi, and K. Yamoka, Biochim. Biophys. Acta 1381, 312 (1998). Scheme 1. One-electron redox intermediates in the disulfide/dithiol couple. tautomeric equilibrium with a carbon-centered form.6 In hen egg white lysozyme, reduction of the disulfide bridge between Cys-6 and Cy s-127 leads also to cleavage of the polypeptidic backbone,7 which indicates a similar electron migration. The redox properties of both disulfide and thiyl sulfur free radicals are believed to be different; disulfide radical is reductant whereas thiyl radical is oxidant. However, to date there is no experimental method for measuring the one-electron reduction potentials of the disulfide/disulfide anion and thiyl/thiol couples in proteins or in small molecules. General Kinetic Scheme y radiolysis and pulse radiolysis provide a unique way of testing the redox properties of the sulfur free radicals and the reactivity of disulfide and thiol functions toward reductants and oxidants, respectively. The easiest way is through reduction of disulfide bonds, because the C02~ free radical has proved to be able to induce a rapid and specific one-electron reduction of disulfide bonds. Kinetic studies of the reduction process have been investigated in small molecules8"11 as well as in some proteins.12"16 The elementary reactions induced during this reduction process are given in Scheme 2. 6 L. Grierson, K. Hildebrand, and E. Bothe, Int. J. Radiat. Biol. 62, 265 (1992). 7 J. Berges, E. Kassab, D. Conte, E. Adjadj, and C. Houee-Levin, J. Phys. Chem. 42, 7809 (1997). 8 P. C. Chan and B. H. J. Bielski, J. Am. Chem. Soc. 95, 5504 (1973). 9 A. J. Elliot and F. C. Sopchyshyn, Radiat. Phys. Chem. 19, 417 (1982). 10 A. J. Elliot, S. Simsons, and F. C. Sopchyshyn, Radiat. Phys. Chem. 23, 377 (1984). 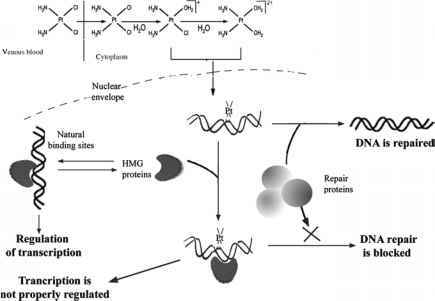 11 C. Von Sonntag, "The Chemical Basis of Radiation Biology." Taylor & Francis, Philadelphia, NJ, 1987. 12 M. Faraggi, J. P. Steiner, and M. H. Klapper, Biochemistry 24, 3273 (1985). 13 V. Favaudon, H. Tourbez, C. Houee-Levin, and J.-M. Lhoste, Biochemistry 29, 10978 (1990). 14 V. Favaudon, H. Tourbez, C. Houee-Levin, and J.-M. Lhoste, J. Chim. Phys. 88, 993 (1991). 15 C. J. Koch and J. A. Raleigh, Arch. Biochem. Biophys. 287,75 (1991). 16 D. Conte and C. Houee-Levin, J. Chim. Phys. 90, 971 (1993). Scheme 2. Kinetic scheme of the one-electron reduction of protein or peptide disulfide bond reduction by COO"~ radicals. The first step is the formation of the disulfide radical P/SS'~ [reaction (1)]. Under acidic conditions it is protonated (P/SSH ) [reaction (2)]. The disulfide radical decay may involve several reactions: disproportionation [reaction (5)] and SS bond cleavage leading to the thiyl radical and a thiol or thiolate function [P/(SH)S ] [reaction (3)]. This latter reaction is usually much faster with the protonated radical [reaction (4)]. The relative importance of these reactions varies from one protein to another. Electron transfer from disulfide anion to other residues and/or the polypeptidic backbone may take place [reaction (8)]. It was suggested that thiyl radicals are able to oxidize tyrosine residues in an inter- or intramolecular process,17'18 but there is no experimental evidence for this reaction, and thus it is not shown in Scheme 2. For biological effects, the key reaction is thus the protonation equilibrium of the disulfide radical [reaction (2)], because it allows the transformation of a mild reductant (disulfide radical) to a strong oxidant (thiyl radical).18 The thiyl radical dimerizes, leading to an intermolecular disulfide bond, that is, a protein dimer [reaction (7)]. In the presence of formate ions, it can also oxidize formate ions [reaction (6)]. The whole process is thus a chain reaction. 17 W. A. Priitz, J. Butler, E. J. Land, and A. J. Swallow, Free Radic. Res. Commun. 2, 69 (1986). 18 W. A. Priitz, J. Butler, E. J. Land, and A. J. Swallow, Int. J. Radiat. Biol. 55, 539 (1989).